CARBONDALE, CO APRIL 30, 2010 The brother team of Stephen and Brandon Watson, in the Offroad Design Racing Ultra4 car, lead the pack at the 2010 BITD Silver State 300 for over 220 miles. “We really felt like the car was dialed in, so we decided that we were not going to just finish this race, we were going to go for the win!” said Stephen Watson. Starting second of sixteen in the Ultra4 class, all they had to do was keep everyone behind them. Stephen Watson drove an exciting first 165 miles passing other classes, and finally caught the only Ultra4 competitor they had to pass. Unfortunately the car had flipped, so after stopping to make sure they were OK, they proceeded into the clean air in front of the entire Ultra4 class. Between being passed in the pits and passing the same cars back in the desert while they were stopped, the Watsons put a few minutes on the competitors until the driver change at pit 4. Brandon Watson, driver of record, took the steering wheel for the second half of the race and headed right into the Caliente Loop which had become a silty mess where the 4WD was important to power through. The silt mixed with water crossings forced a quick pause in pit 5 for the ORD crew to throw a new Amsoil air filter in the cab to be installed if needed. And then the race really started. With radio contact coming back that they were holding the lead by only seconds, they hit a huge rock in a wash and wiped out the left front tire which cost them over a half an hour when the jack sunk in the sand and the car fell on it. “We were pretty down about losing the lead, but thought that we could still put in a good run for the podium,” said Stephen. With finally making the emergency air filter change alongside the racecourse and hitting another huge rock that would take out anything that was thrown at it, the brothers were even more challenged for time. The Goodyear GSA tire didn’t even budge, instead the sharp edge broke the normally bombproof wheel shell and wiped out the brake caliper, rotor and caliper mount. They quickly fixed it with some of the broken pieces of the caliper mount to space out the spindle properly to keep rolling. Luckily the ARB air locker in the front axle assisted with braking straight even though the right front had no brakes at all. “And from there we just took it easy to the finish line, although I think we came in here at 75mph,” laughed Brandon. 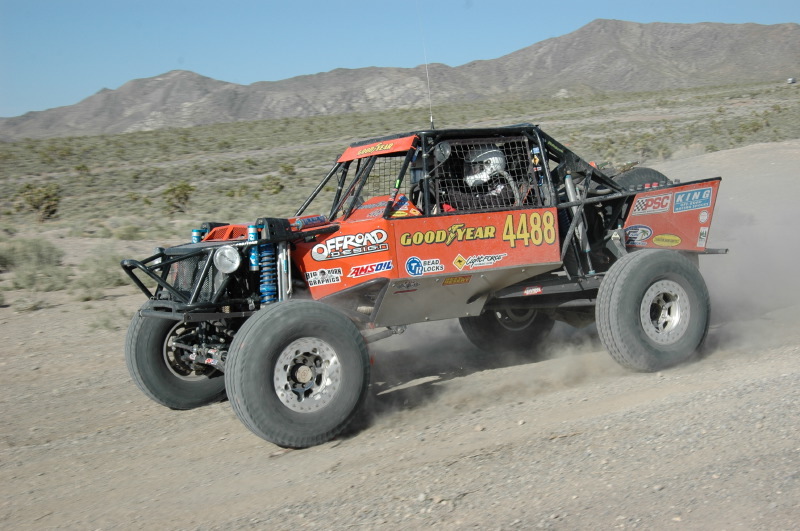 The Offroad Design team finished in 6th place in the Ultra4 Class at the 2010 Silver State 300, and is currently ranked 4th in the Ultra4 Grand Slam of Offroad Racing after two races in a four race series.